While remodeling their home in ,Illinois in 1971, Ray and Pam Bruzan found a tintype photograph of a man holding two children on his lap. 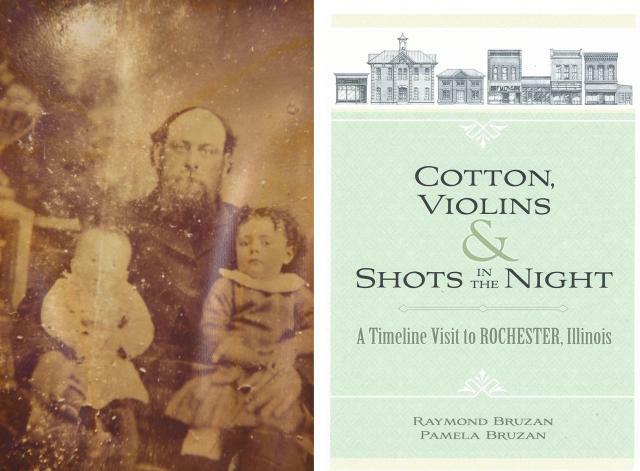 This photo led them on a journey into the history of Rochester that eventually became the book Cotton, Violins & Shots in the Night: A Timeline Visit to Rochester, Illinois. The Bruzans will share some of the stories and photographs from their book, which will be for sale after the presentation. Bring your lunch and join us for a different speaker and topic on the third Wednesday of each month. Brown Bag Lectures are held at the ISM Research & Collections Center at 1011 E. Ash St. in Springfield. * For additional information, please contact events@illinoisstatemuseum.org or (217) 558-6696. *The Collections Center cannot currently be reached from Ash St. due to construction. You can access the facility's entrance on 10 1/2 St. from Laurel St.